Today I wanted to give you a little picture (or a few pictures) of where the slipcover "magic" happens. Like many slipcover makers, I work from home, which, I will confess, is definitely part of the appeal of this job. 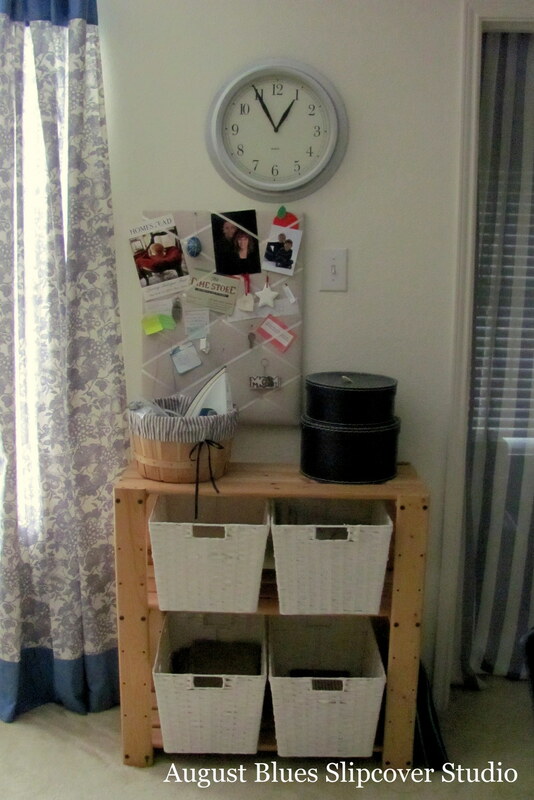 And while our house is not overly large or fancy (by North Texas suburb standards), it does permit me to have the space I need to get most jobs done. 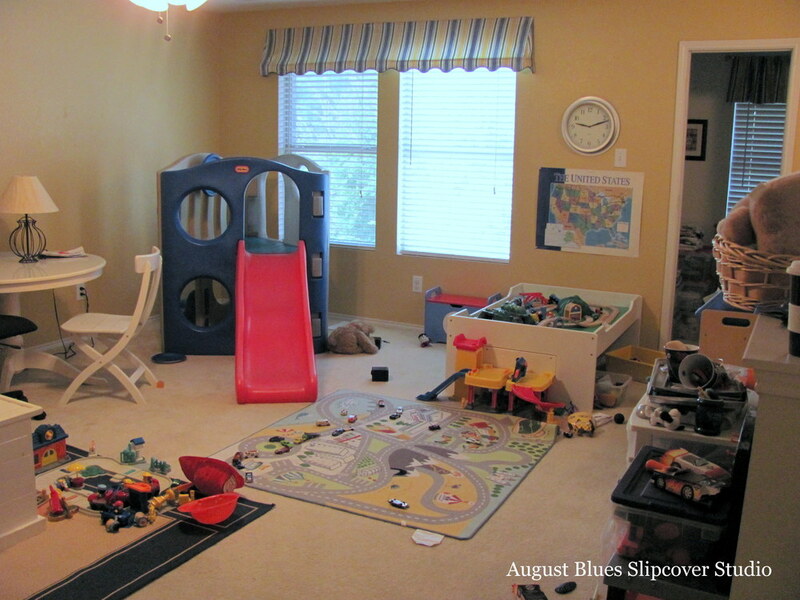 So, let me give you a tour (I tidied up a little for you)! 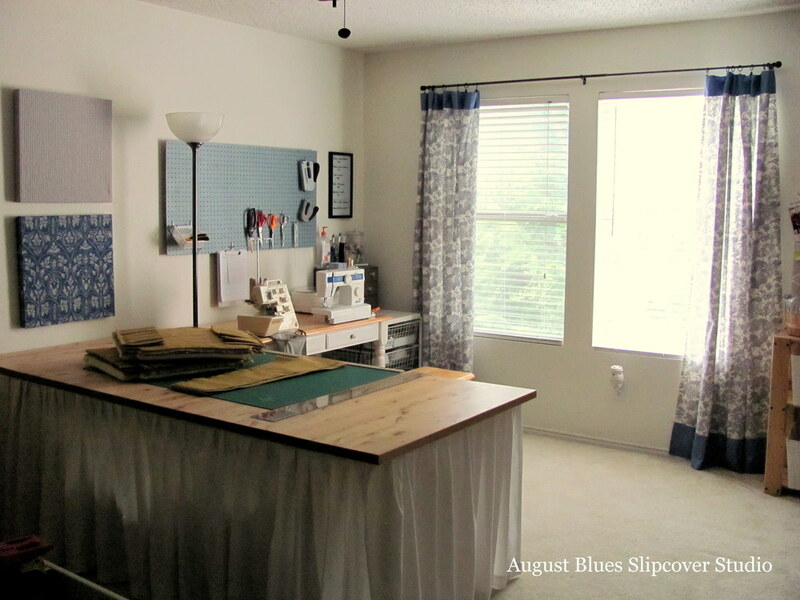 If you turn to the right just a bit, you will see my actual sewing space. This space changed a lot when Mary came to work with me - having two people working in the space meant thinking it through differently. Floating the large table in the middle was a game-changer! ... and the smaller machines tucked in the corner by the window. I love the big windows! Storage is important! 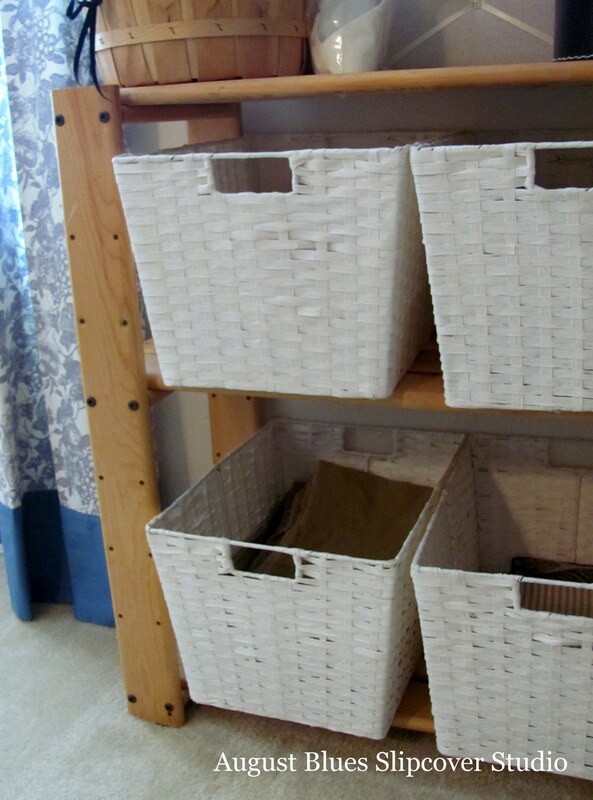 These bins contain supplies designated for specific projects (and they can be labelled with dry erase marker if needed). The peg board is a must, as is the board to keep track of projects (I framed some fabric - the glass acts as the dry-erase board). I love this table! We have had it since our previous house in Canada, where we had a dining room big enough for it (this is the Norden table from IKEA, but I guess they used to make it bigger - ours measures 86" long x 39" wide without the extra leaf!). Someday we'll have a large dining room again - in the meantime, it makes an excellent cutting table. 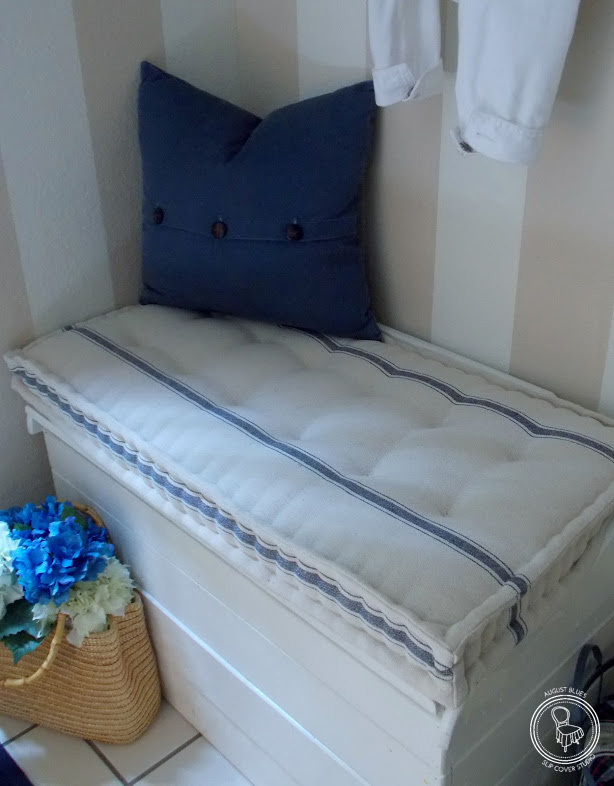 Especially when you raise it up with bed risers, and cut plywood to fit the supports underneath to get storage for fabric rolls -- game-changer! 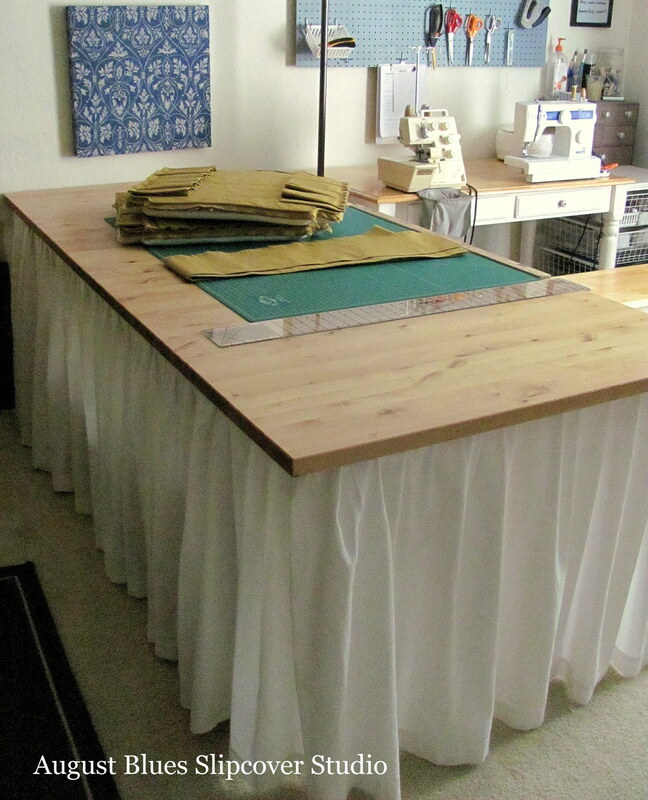 I really enjoy making slipcovers, but it's ever so much more enjoyable to have a space that works. It's not perfect (it doesn't have double french doors so furniture can be brought straight in - that's for another house! ), and will be adjusted as my needs and equipment changes. But, for now it makes me smile and that's mission accomplished! 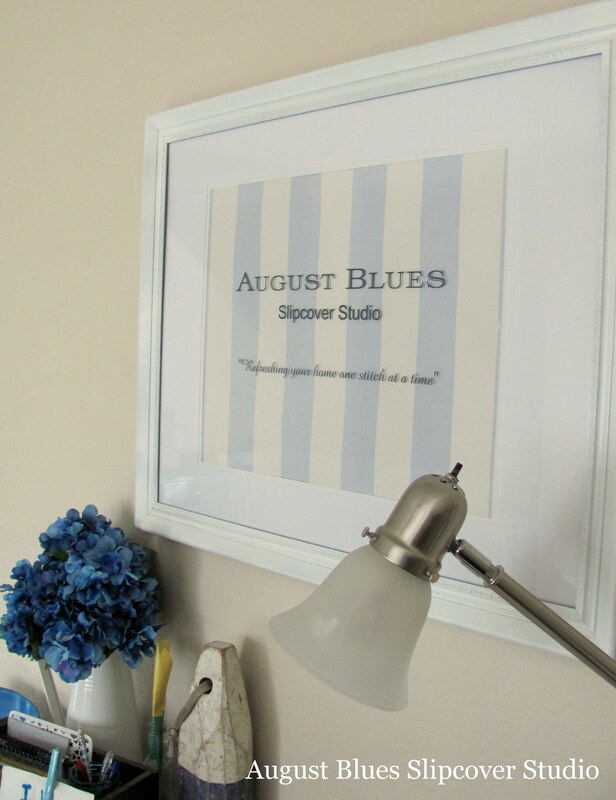 This fabric was a perfect choice - a linen/cotton blend with a spa blue stripe (and, yes, this fabric has also showed up here and here). We chose to design the slipcovers with a waterfall-style skirt so the stripes wouldn't be interrupted by seams. And I fit it so no closure was needed - it just slides on and off. Now these chairs have a fresh new look, perfect for their new home at the lake! Is lake-ing part of your summer tradition? 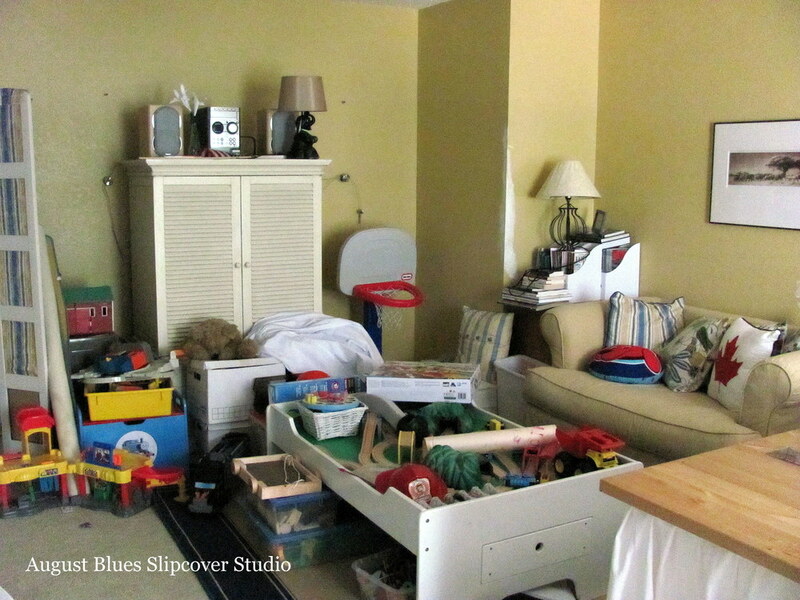 You know I love a good before-and-after :) Well, this is a great one! My client found this chair at a thrift store for a steal. Although it was orange, it was in great shape and she had a vision for what it could be. Now I know who to go thrift store shopping with! Have you come across any good finds lately? 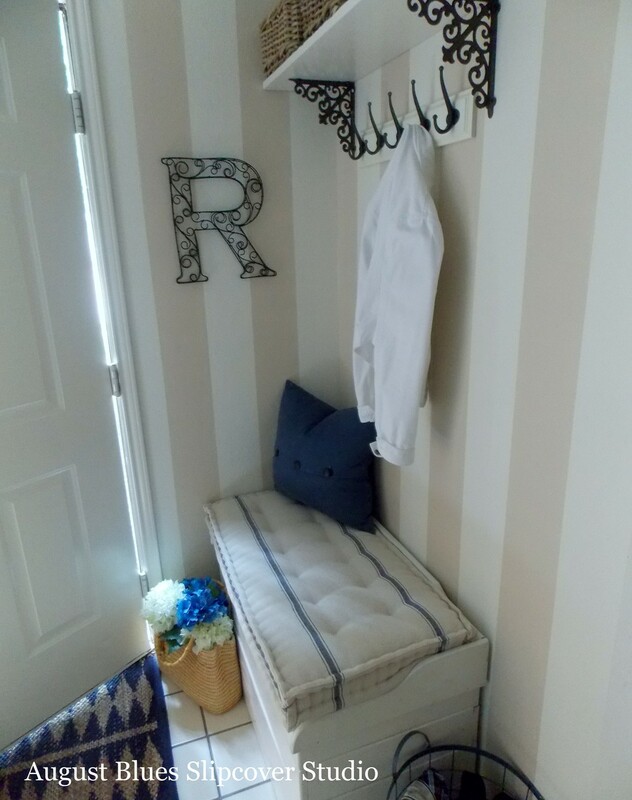 For this project, I made a new cushion for a bench/trunk that lives by our front door (you can see the space here, with the original cushion). As soon as I had a chance to work with the feedsack fabric from Decor Steals, I knew that was the fabric I wanted to use for this new cushion. Please note: this is not a slipcover! You will not be able to take the cover off the cushion once you have constructed it. ...the piece of batting with the notched corners will wrap around the sides of the foam, to meet the top piece. You can use spray adhesive to tack the layers together to make it easier to insert it into the cover later, but I managed fine without it. Now, insert the foam and batting "sandwich" into the cover. This takes a bit of work, depending on how big your cushion is. The important thing is to make sure that you have the batting covering all the way up the sides of the foam and that everything is lying smoothly. You will not be able to go back in to fix it after this point. Now comes the fun (but labor-intensive) part that makes these cushions unique - the hand-stitching and tufting! I put the needle straight down from the top in order to grab some of the batting (and maybe the edge of the foam) inside and then angled the needle toward the side panel and pulled it through. Your top and side stitches will be staggered. Pull the thread firmly and continue down the edge. 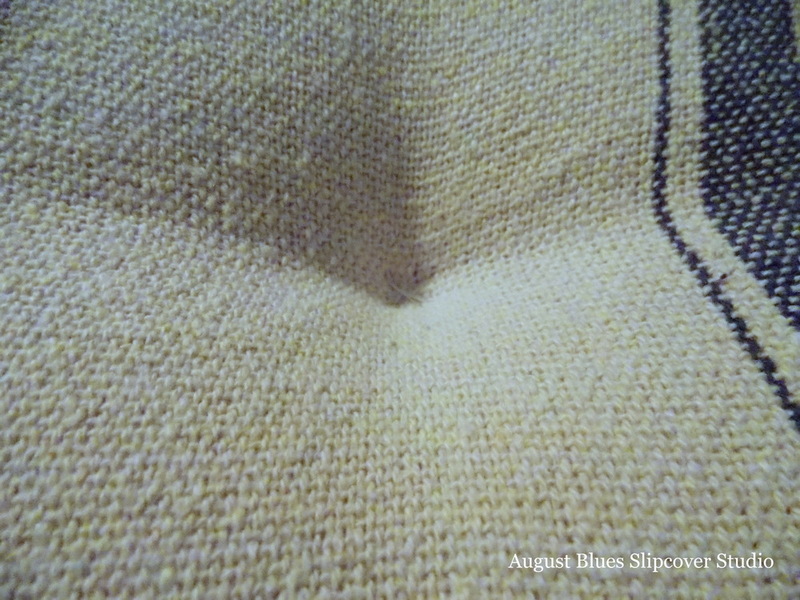 I started my stitches on what would be the bottom of the cushion to establish the rhythm/pattern of the stitches. The edge should end up looking wavy and kind of "fat". 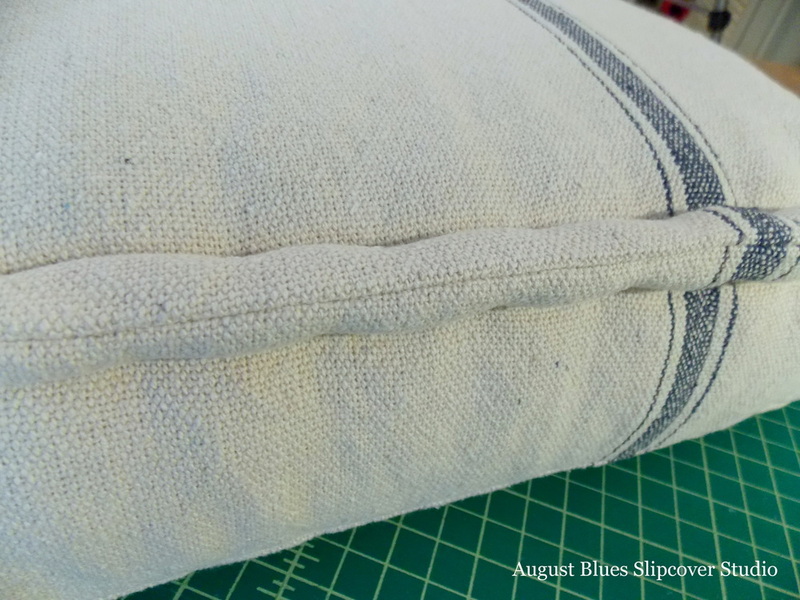 Depending on the depth of your cushion, you may want a stitch or two along the vertical corner seams, too. Lots of hard work for your fingers! ... This is what gives that "channeled" look around the edge. Go all the way around the top, knotting the thread securely as you go. Edge stitching done! Now, give your fingers a rest - tufting is next! First, mark where you want your tufts to go - I divided the cushion into three, to give me two rows of tufting. Yes, math is involved, since you want you tufts to be evenly spaced across the width and length of your cushion. I marked with pins on the top and bottom (because your tufts need to go straight through the cushion), but you can use chalk or pencil or whatever will be invisible once the cushion is finished. I used a long upholstery needle (about 5" long) and strong thread, doubled (you could use upholstery thread, but I found it too slippery to knot securely to make the tufts). My thread was about 20" long, after doubling - this was enough length to go through the cushion twice and be able to be knotted. 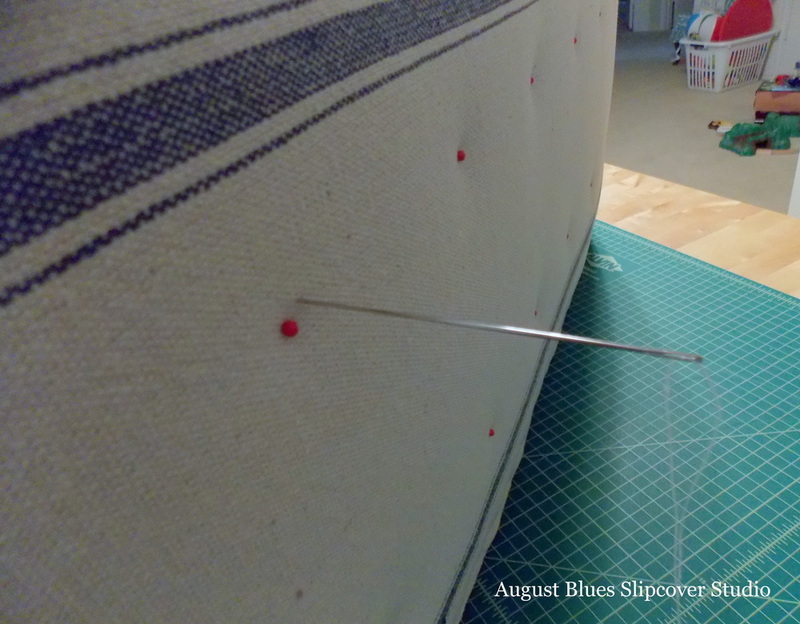 So, put your needle straight through the cushion, making sure it comes out close to your marking on the other side. Make a 3/8" - 1/2" stitch and pull the thread back through to the side you started on. Pull thread/stitch firmly and knot it securely. Note: consider how much tension you put on the thread, since you will want all your tufting indentations to be pulled in the same amount. Get another length of thread and make another stitch through the cushion, making an X with the first stitch; pull and knot securely. Continue with the rest of your tufts, being careful to pull each tuft so it looks like the others. Tie the last thread and rejoice that you are done! 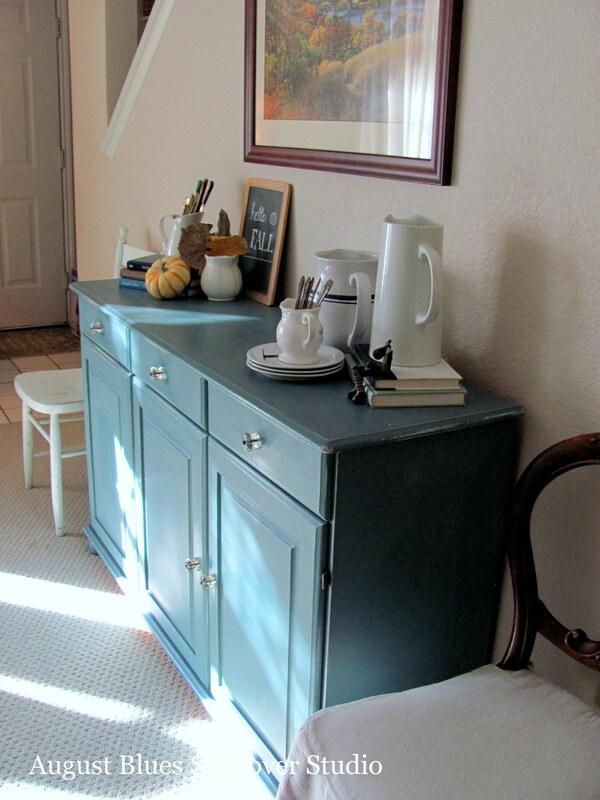 Are you ready to add a little French style to your home? Oh, I'm just over here having some more fun :) I've had some scheduling kinks, so I decided to take advantage of the in-between time to tackle a project that has been on my to-do list for some time. 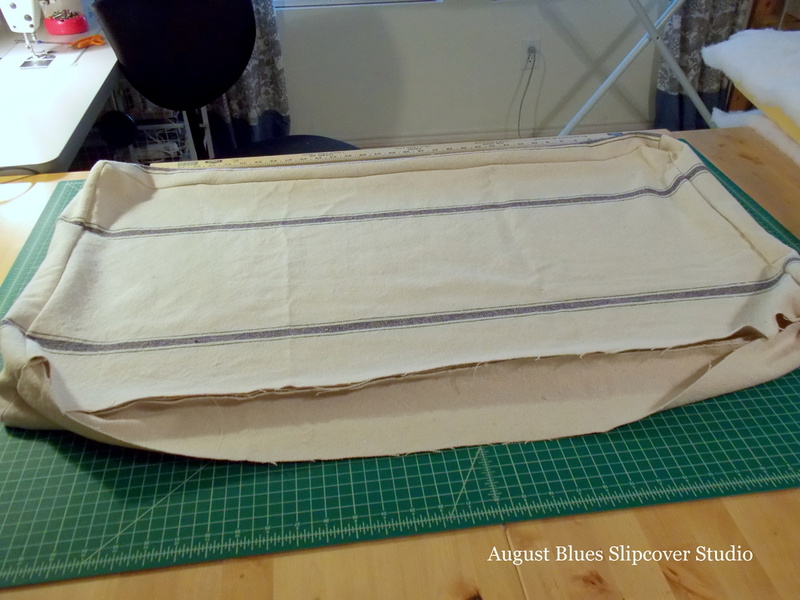 I loved that I could use the scalloped edge of the bedspread for the bottom edge of the slipcover! Fast-forward to life now and this cute white chair was not so white anymore, and it was sort of floating around the house looking for a "home." 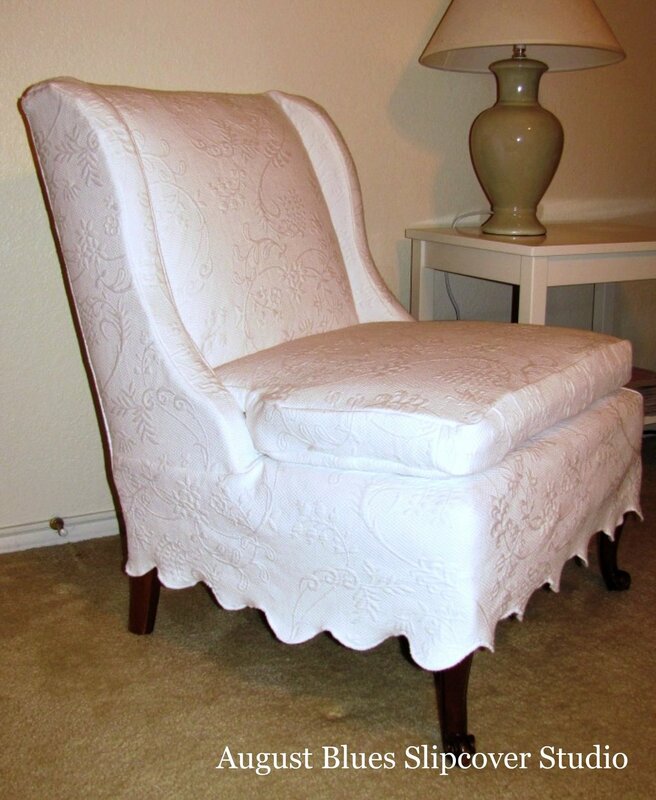 Then I found a great fabric remnant and thought of this chair right away. It took me a little while to get around to making the new cover, but now she's done and looking super cute! Are you ready for some cuteness overload??? I usually take my "cute" with a little more subtly, but this just had to be done :) And I love that it looks like a completely different chair! 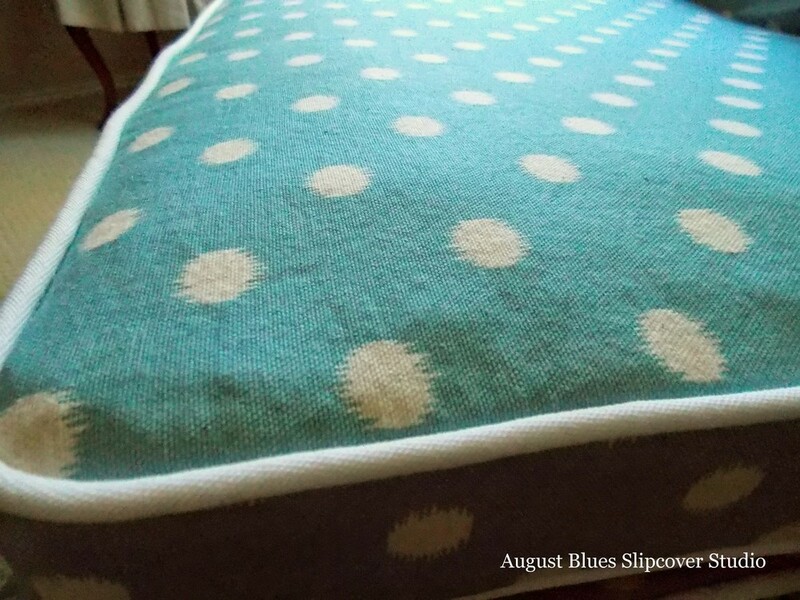 Here is a close-up of the fabric - it's kind of a dusty (hard to photograph right - it's not as bright as the pictures) aqua blue with ikat polka dots - fun! Twas the night before Christmas (well, it was actually the day of December 23...), and all through the house, a sewing machine was humming (and it wasn't a mouse... thankfully!). 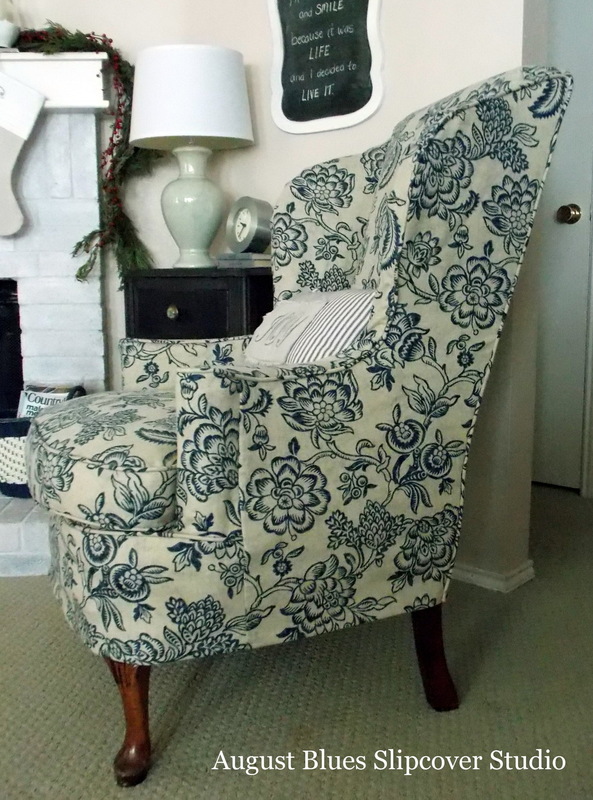 Yes, I did quickly finish one more slipcover project just before Christmas. And I love how it turned out! I love this chair! I purchased it through Craigslist a few years ago. The list price was $30. When I contacted the owner to arrange the purchase, someone else was already coming for it. When that sale fell through, she told me I could have it for, get this, $10!! Down-filled seat cushion and all! The scale is great for our house, it is comfortable, and I really like the unusual flared arms. It's a different look for the chair, and I love it (have I said that enough, yet?)! The chair has a story and the fabric does, too. 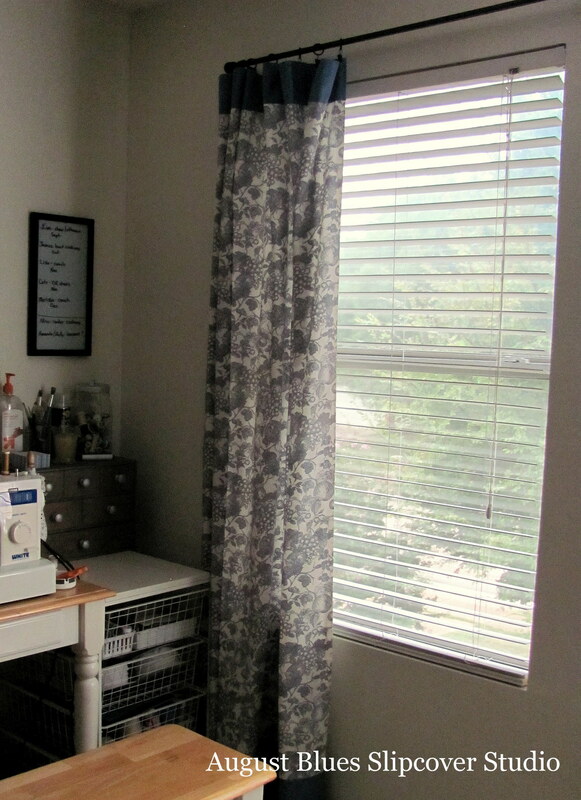 I purchased a sample of this fabric when I was considering fabric for the family room curtains a couple of years ago. I decided to go with a different fabric and didn't think about it again. Then, this summer when I was shopping at Colorado Fabrics in Denver, what did I find but a roll of this fabric! Sold! It is Richloom Bircham Printed Cotton Twill Drapery Fabric in Cottage. 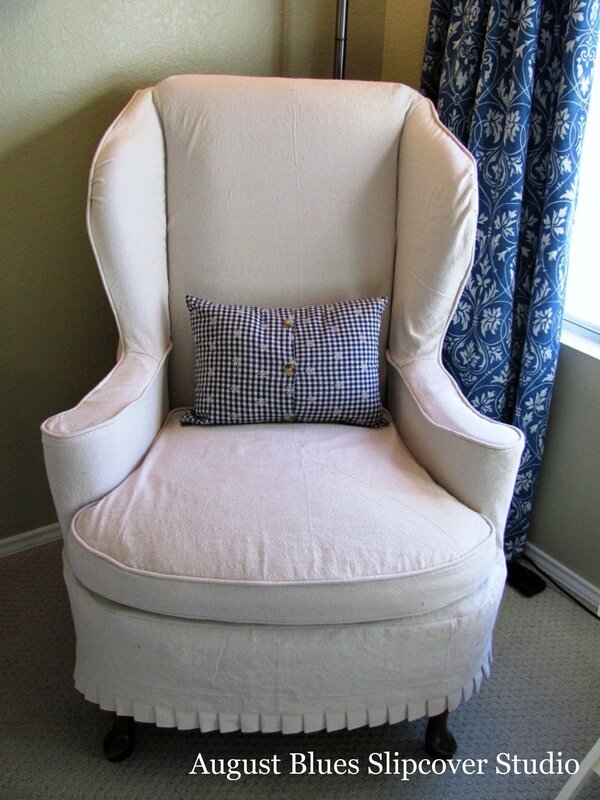 It is a great weight for a slipcover. 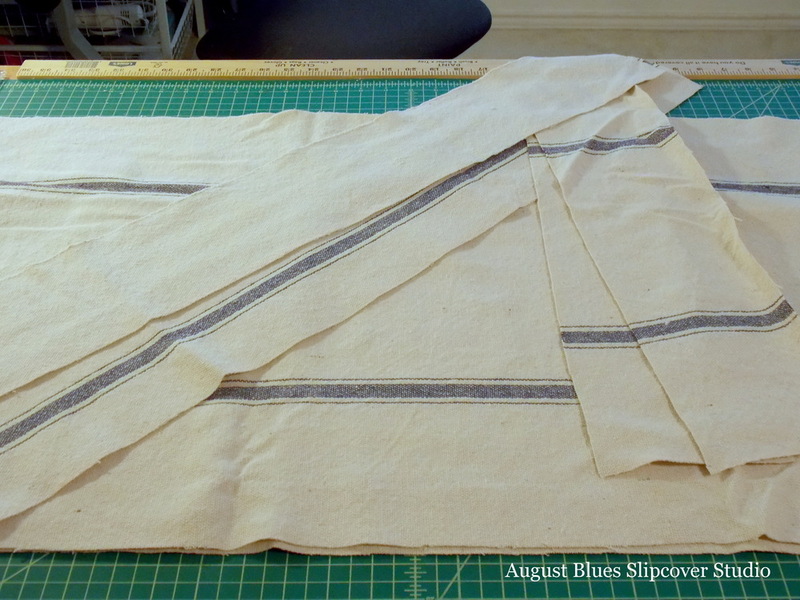 ...and a simple back piece with corner zipper. 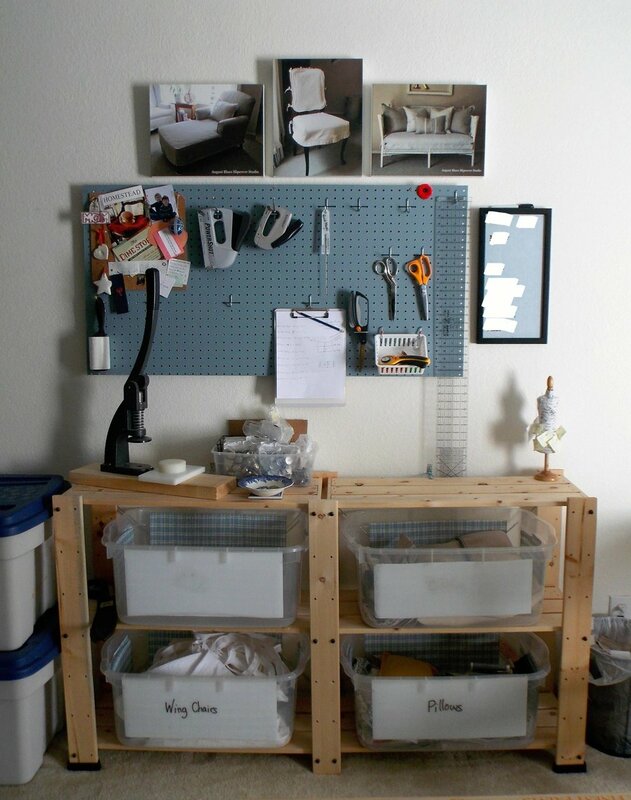 Did you do any last-minute projects this year?